Bluebird from American Express is a prepaid card that cuts fees and offers banking and shopping features that beat many competitors. You get the convenience of a prepaid account with banking features like direct deposit. Plus, you get access to money-saving Amex Offers that otherwise are only available with credit cards. Smart customers living debt free are making Bluebird a top choice to manage their finances. Let’s dive into what Bluebird from American Express offers! Many prepaid debit cards come with tons of fees that end up costing the cardholder an enormous amount of money. Bluebird from American Express is a clear winner in this category as it does not have an annual fee or any monthly fees to keep the account open. You can request a Bluebird card online for free or purchase at participating retails stores for $5. Unlike applying for a credit card, your credit report will not be pulled when you order a Bluebird card. There are several ways to deposit money, including mobile deposit. Image courtesy of bluebird.com. There are several ways to add money to your Bluebird account. Some require you to visit Walmart, while others can be done online or through a mobile device. Regardless of the method you use to deposit money into your Bluebird account, the maximum amount that you can add is $100,000 per year and $10,000 per month. If your employer pays you via direct deposit, you can link your Bluebird account so your paycheck will automatically be deposited into it. The payment must come from a U.S. bank account for Bluebird to accept the deposit. You will not be charged a fee to deposit money with this method. You can designate your Bluebird account to receive your tax refund if you will be receiving one. You will not be charged a fee to deposit money with this method. You may also deposit money into your account through a bank debit card. Deposits may be made via your Bluebird account online or through the Bluebird mobile app. You may deposit up to $200 per day and $1,000 per month. You will not be charged a fee to deposit money with this method. Cash may be deposited into your account at Walmart Money Centers. You can also deposit money with your debit card in person at Walmart. These deposits are considered cash deposits. You can deposit up to $2,500 ($1,999 at Walmart) per day and a total of $5,000 per month. You will not be charged a fee to deposit money with either of these methods. You can also deposit cash at other retail locations, but the fee to do so could be up to $3.95. If you need to deposit checks, you can do so through the Bluebird mobile app thanks to its Mobile Check Capture ability. You can deposit up to $5,000 per day and $10,000 per month. Like most deposit methods with Bluebird, this one does not have a fee. You can pay bills online with your Bluebird account. Image courtesy of bluebird.com. Your Bluebird account comes with a bill pay feature that makes it easy to pay rent, utilities, car payments, and more. You can make payments online or through the mobile app. When you use Bluebird’s bill pay feature, they will send a check on your behalf. If Bluebird does not already have your payee listed, you can add a new payee. However, you are limited to payments of $5,000 per month to payees you add, while you can send listed payees up to $10,000 per month. You may use your Bluebird card to make up to $15,000 in purchases per month. Your Bluebird card can be used anywhere American Express is accepted. You can send up to $2,500 per month to friends and family. 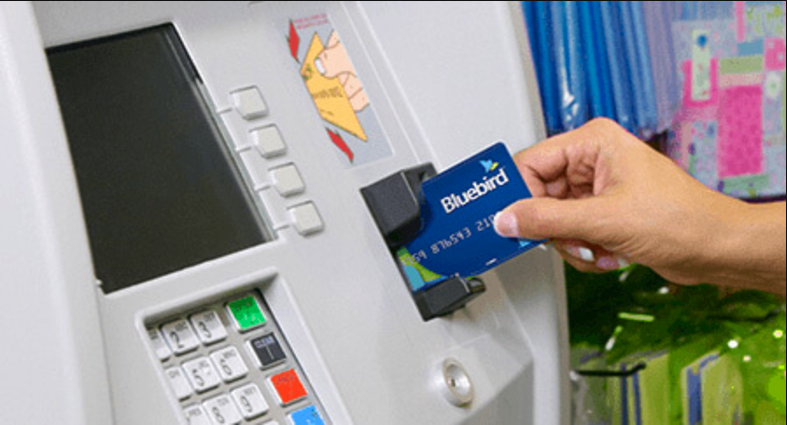 Your Bluebird from American Express can be used to withdraw cash at any of the over 24,000 MoneyPass ATM locations across the U.S. You may also withdraw cash from out-of-network ATMs, but there is a $2.50 fee for each withdrawal (plus any fees required by the ATM’s network). You may transfer up to $15,000 per month from your Bluebird account to a linked bank account. This can all be done online. You can request paper checks to use, but there is a $19.95 fee plus shipping and taxes. If you want to write a check for $2,000 or more, you are required to get pre-authorization to do so. This process can take a couple of days. A Bluebird feature unlike other prepaid cards is that you can save money shopping with Amex Offers. 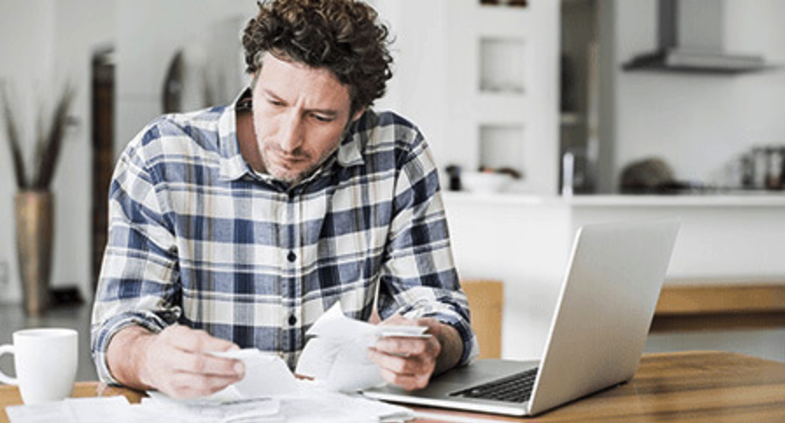 Amex Offers are limited-time offers that update regularly and different from account to account. You can find discounts at a variety of retail stores, restaurants, and more. These offers are time-limited and new ones are added regularly. Bluebird does not earn miles or points. Its focus is on daily financial management rather than travel rewards. If you prefer to manage your finances with a debit card rather than a credit card, Bluebird is a great option. Bluebird has many of the features of a traditional bank account such as direct deposit. Fees are low compared to competitors. Plus, you get access to money-saving Amex Offers that otherwise require an American Express credit card. Those who want to live debt free or are repairing their credit will find Bluebird a compelling product. Bluebird from American Express is a reloadable prepaid debit card that is a popular alternative to traditional bank accounts. How do you deposit money into your Bluebird account? You can set up a direct deposit your paycheck or visit Walmart to deposit cash, checks, or load with a debit card. Additionally, you can deposit a tax refund into your Bluebird account. My son has no credit card right now and need to stay in a hotel to attend a convention. I have booked a hotel for him. Can he use his bluebird card to pay for a hotel accommodations? Unfortunately, this card cannot be used for hotel reservations. Please see their terms here: https://www.bluebird.com/legal/member-agreement.html#useofbluebird – search for the word “hotel” on that page and you’ll see the relevant section. I was able to use my card to book a hotel room back in February. don’t know about hotels, but first how do you get your card registered? I have tried for months now and could not, I did get to use it, but now can not put more money on it and will not register at your site, so got a new card and you will not allow me to excess my money? I’d call up Amex and request a new card with Jr. on it if it’s important. I got it originally to use with my Walmart price matching tool. Then got my paychecks direct deposited to it when I got a new job that didn’t give paper ones. It was great until someone stole my information. I called to report it and deactivate the card. Over 2 weeks later, and still no card. No follow up on my fraud case. 2 calls and 2 supervisors later still no way to get my check and only a “it should definitely (probably) be there tomorrow.” One guy had the audacity to ask me what I needed the funds for so badly!!! Food! The electric bill! Gas to get to and from work! When I get my new card I’ll “definitely probably ” get a real bank and just pay the monthly fees to not go through this again. I dont understand why my wifes check is still not given to her? Her name is Megan Smith, you all keep saying, tomorrow tomorrow and its been both those tomorrow’s and its not there !!! Do we need to re transfer it from the one bank and totally just skip yours??? We thought it would help and be easier to just transfer her things to you. But now you have lied to her for two days now. If you say its pending, then where is it?? I’m sorry to hear of your frustrations, but please understand that we are a travel blog. We are not American Express or any bank or affiliated with any credit card. We just write about travel and finance. Please direct your messages to them to help get your situation fixed. I have had Bluebird for the last five years and have been pleased until recent fraud activity. I have had numerous calls recently to resolve the fraud issue. They sent my new card to the wrong address after I had given them the new address. After calling them back several times they still had the wrong address, and I had to specifically tell them to delete the wrong address. I called them back today and gave them the correct address again, and they told me I would have the new card by July 30 or 31. Up to now what they have told me was lies. It was easier for a thief to get my money than for me to get my money. Why does the phone number for blue bird not offer a live person to talk to? I have questions concerning my card use and its always automated. How can I speak with a live person? Hi Rhon, please be advised that we are not American Express. We are Upgraded Points, a website dedicated to points and miles content which, at times, includes credit card reviews. That being said, it is not uncommon for credit card companies to utilize an automated service to funnel you to the appropriate representative. Once you have gone in and entered your social or card number to establish you are a current customer, you can try to say “speak with a representative” or at times, pressing 0 or the # key will cue the service to send you to a representative. Best of luck – maybe someone else reading this article will have a better answer for you and can let us know in the comments below. Can you still really load debit cards to Bluebird? This option doesn’t appear in the app. I’ve had BlueBird for the past 5+ years and I love it. I had some sketchy charges I noticed and called Amex and they immediately corrected things and sent me a new card which I received within a week. The only thing I dont like is now they charge to order checks. Luckily I got my last set right before they implemented the new fee for check orders (to be clear there is no fee to write a check only to order the physical checks). For me I’m a forgetful person, so with bluebird checks you use the app and preauthorize the ck# and amount and it pulls it from your balance so there’s no issues later. Just wish AmEx was accepted at more small mom and pop shops. This used to be a very good card. Not anymore. The past year has seen its decline. No customer service and way to many problems with funds. Check the Consumer Affairs page to see the hundreds on new complaints. Don’t get this card. Worst card ever. Too hard to load money without another bank account, can’t do ACH transactions. Did not live up to the hype, regret even getting this. Just get a regular checking account and stay way from these types of accounts. How on earth are you supposed to add funds to your own account if they won’t let you cut a check to “yourself”? Had to drop the whole program, really frustrating. Other options are taking cash to walmart (no) and transfering $200 by debit PER DAY up to a limit of $1000 per month. For some reason they REMOVED the ability to do direct bank transfers to add funds (essentially like writing a check to yourself, just without the check). No explanation. Made the card useless to us. Avoid this card at all costs. I’ve used it for 2 years with relative ease however I was only getting my paychecks and withdrawing the cash. Recently I started using it more. Any hold that is placed on the account will take 7-30 days to be released. Had to wait 7 days for a Hotel ACH to clear even though the hotel instantly refunded my money. Amex held it hostage for a week. Used it for a rental car biggest mistake of my life. There were multiple Authorizations from the rental car company then one final charge it left the account negative (The reason I got the card was to avoid overdrafts) so when I was paid, another $300 was taken. Got off the phone with them after the 7 days from the rental car had been returned they said I have to wait 30 days from transaction to transaction for the money to be credited. They have over $600 of my money. I should be able to sue or get interest on my money. They basically take your money as an interest free loan. When I asked why it takes so long I was told because it is not one of the accepted ways to add money to the card even though it’s a REFUND. Then when I asked to speak to a supervisor and was told one was not available and they could take my name and have someone call in 1-2 business days.